64-bit Processors On Mobile - Do Others Need To Take The Plunge? The problem with business is that it is based on facts as much as perception. Anyone who undervalues the importance of marketing in Business will eventually fall to the folly of this assumption. Even the share market falls and rises with the perception of a company. There are numerous examples of that in the world. For example, although Apple never said that it would make cheap phone and iPhone C will actually help Apple with its bottom-line, its share fell because people wanted a cheaper phone. The interesting thing is that, it is quite possible that most of the people who own Apple stock might buy the phone itself. Again, it is also possible that people who are selling the Apple shares might be Android phone holders. This means that they would not have bought the new phones whatever be the price. But because the immediate expectation was not fulfilled, the share prices fell. With iPhone 5S, Apple has created a completely opposite impact. It has added two features in the phone that are completely new for smartphones. One is of course the Fingerprint Tracker, which only time will tell is loved like Siri or hated like Apple Maps. Let’s hope this time Apple has not launched it half-baked but has worked on it thoroughly. No other company has any answer for this right now. More importantly, as many phones have moved to capacitive buttons, adding this feature will be more difficult as well. Besides, most are still holding their breath on how this experiment of Apple turns out. A 64-bit processor on the other hand is easier to explain, understand and implement. We have already transitioned to 64-bit processor in the computer arena. People have a general idea about it (More bits better type). Above all, PC has reached the necessity of 64 bit processor with more than 4 GB RAM. My laptop has 8GB RAM and I would be very annoyed if only 3.5 GB was being used of it. In the phones however, there was not much thought over this as of now. Most phones have 1 GB or 2 GB RAM and only Samsung Galaxy Note 3 has 3 GB RAM. Which means it would be at least a year before we have any phone with 4 GB RAM or any need for 64-bit processor. This whole talk is of course about Android. 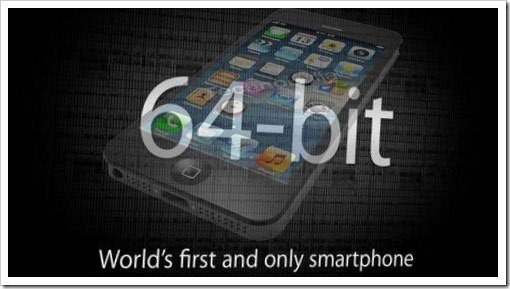 iPhone is now 64 bit with iOS 7 supporting it completely. It has not more than 2 GB RAM but that is another matter. Also, because the apps made for iOS are specifically made in a particular environment it is comparably easy to recompile them in the 64-bit framework. So, in all, the transition would be smooth as far as Apple is concerned and as they have already started by the time other companies offer 64-bit, Apple would have raced ahead, again. Android is not yet on 64-bit but I believe that hardware manufacturers will put pressure on Google to do so. Samsung has already said that its next flagship would be 64-bit. Other companies must also be thinking on the same lines. When it happens, the app transition to 64-bit will be messy as well. I see another round of fragmentation in Android’s future. The biggest joke in the whole situation is that phones actually do not need 64-bit for another 3-4 years. But now that the genie is out in the open, no one wants to be left behind. Apple has made iPhone lucrative without making any change that will be visible for another 3 years. It has also put Android in a fix. All based on brand perception. What’s your view?